Several weeks ago, there was a package dropped off at my door that I wasn't expecting. Imagine my surprise to open it and find some beautiful (and fabulously scented!) holiday air fresheners! The package was from Purex! I'm a Purex Insider, so I get wonderful packages from them throughout the year with products to review and give away. What I didn't know is that Renuzit is one of Purex's sister brands. Those who know me well know that I am a candle & air freshener FREAK! I love to have wonderful fragrances in each room of my home. So, I was really excited to dive into this package! 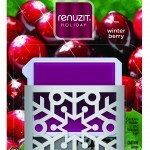 Renuzit has a brand new air freshener product this holiday season! It's an attractive air freshener that features a stylish two sided-holiday design. It comes in two amazing holiday fragrances: Winter Berry and Festive Snow. Each lasts for 30 days, and there are no plugs, batteries or flames needed! My package contained one of each to try out. I put one of these air fresheners in the family room, and one in the master bedroom. It's been 3 weeks, and the fragrance is still going strong in both of these. I prefer sweeter scents so Winter Berry is definitely my favorite fragrance of the two. And my favorite part of this post is the giveaway!! 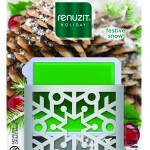 Renuzit was kind enough to send me three coupons for a FREE Fresh Accents Holiday Air Freshener, so there will be three winners this time, each receiving one coupon! As always, I'm using a Rafflecopter entry form to make entries quick and easy. Click the "read more" link to enter! Disclaimer: Renuzit & Purex provided me with two air fresheners to review, and three coupons for free products to give away. All opinions are my own honest opinions! I'd like to try the winter berry. I would like to try the winter berry also- no same old boring holiday scent. the festive snow and or winter berry but I think the festive snow sounds like it smell good! I like to try both scents...but i would like to winter berry. festive snow ! It is winter after all !